Starter: Check out one or both of the following videos - a really amazing time lapse short film. If the first one doesn't work, click here to be taken the the Vimeo page where it is hosted. Don't forget to hit full screen to get the full effect. Knowledge check! - So, what does 8850 refer to then? Any ideas? Write down ten adjectives that you would use to describe Mount Everest from what you have seen in the video. Five must be under the title of 'Dangerous Everest' and the other five under the title of 'Incredible Everest'. The music to the right should help to inspire. 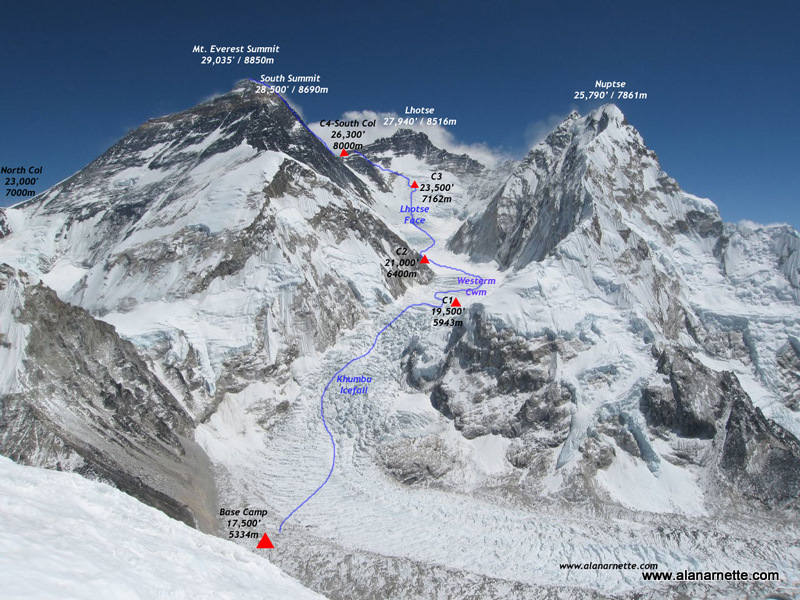 2013 was an important year for Mount Everest. i. Wind the clock back 60 years from 2013, what year would you be in? ii. 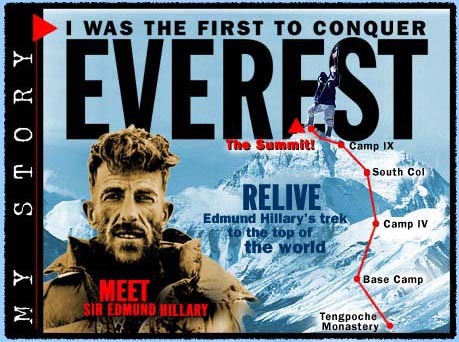 Conduct a quick Google search with that year and 'Mount Everest' and find out why and what happened back then. Where is Everest & What's it Like? Objective: To find out about the conditions that surround the highest mountain in the world. *On this map, you will see Tibet, but on other maps all you will see is China. 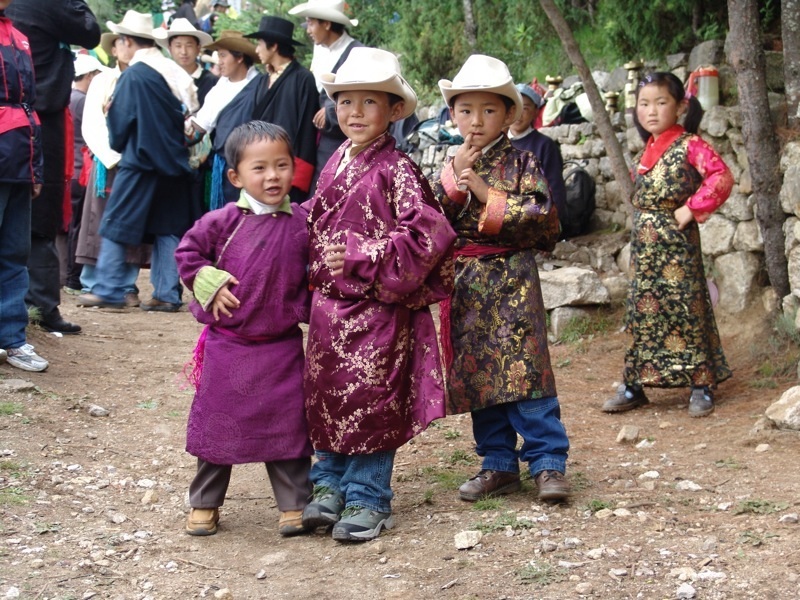 Click here to find out more about the trouble between China & Tibet. Task 1 - Using both the fact sheet and the map (above), create your own annotated 'Where is Everest & What's it Like' fact sheet. You should include the location of Everest as well as your chosen 10 facts. Use the Google map to the right to help you. Adding an unusual image and caption from Everest will also help to improve the presentation of your work. This would be my chosen image. Objective: To find out how and when Mount Everest (a Fold Mountain) was formed and to see if it is getting taller. Task 1 - Watch the YouTube video to the right hand side. This is a documentary but you only need to watch up to 10.35. You might find it helpful to make some notes on what you see and hear. Use this worksheet to help you. The climber you will see in the video is called Kenton Cool and he holds several Everest records including the one to the right where he sent the first ever tweet from the summit of Everest. You can find out more about him here. Cartoon Strip Task - EVEREST - 50 MILLION YEARS IN THE MAKING. You will be creating a cartoon strip to show the formation of the Himalayas in six stages. You can use the video and the fact sheet (above) to guide you. For the video, the timings of the useful clips are indicated for you. How much do the scientists calculate that Everest is growing by each year? How did the scientists measure this? How long would it take to grow another 100 metres? A quarter of an inch is approximately 0.6cm. Stage 2 - The formation of the Himalayas caused by the movement of India. Will Everest always be Number 1? Are there other forces at work? 3. Explain why Everest is growing & how it was formed. Most people will have no idea about this. 4. 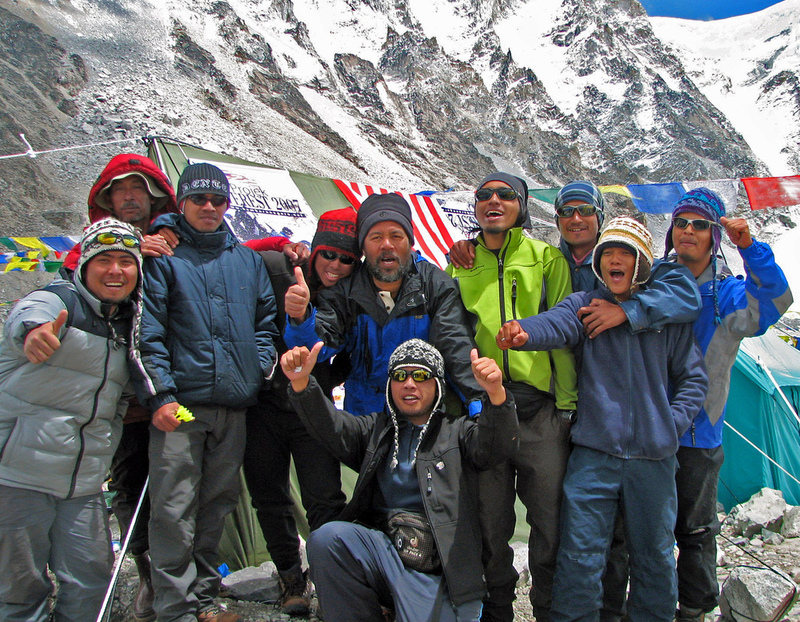 Why 2013 was a big year for Everest? Don't forget to add a price and your name. Spell check, proof read and then print out. Who Lives in the Everest region? 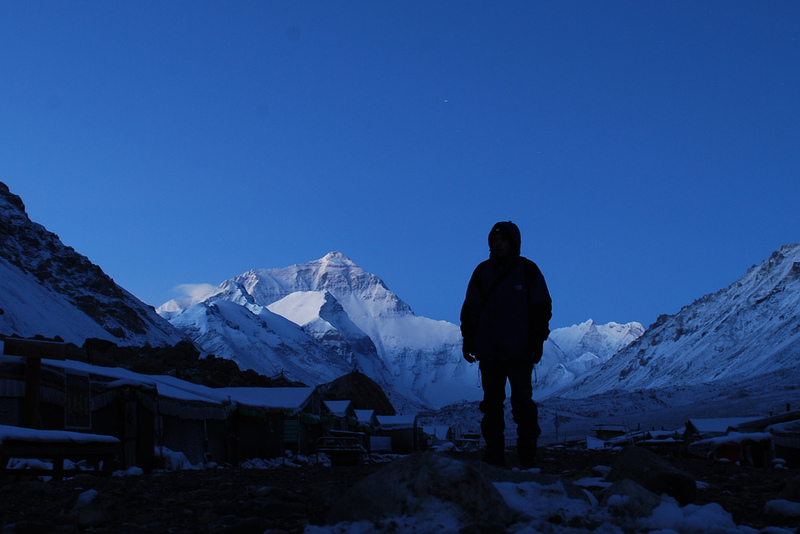 Objective: To find out who lives close to Mount Everest and how these people help mountaineers to climb Mount Everest. Open this worksheet and complete the tasks set out - target 10 minutes. Task 2 - The Sherpa Profile. You must now read the first fact sheet carefully If you are using PDF, you can use the online highlighter tool (ask your teacher to show you) to show the most important information about the Sherpa. *Hint - most people think that 'Sherpa' is a name given to people who carry the equipment of climbers and have no idea that they are a race of people. 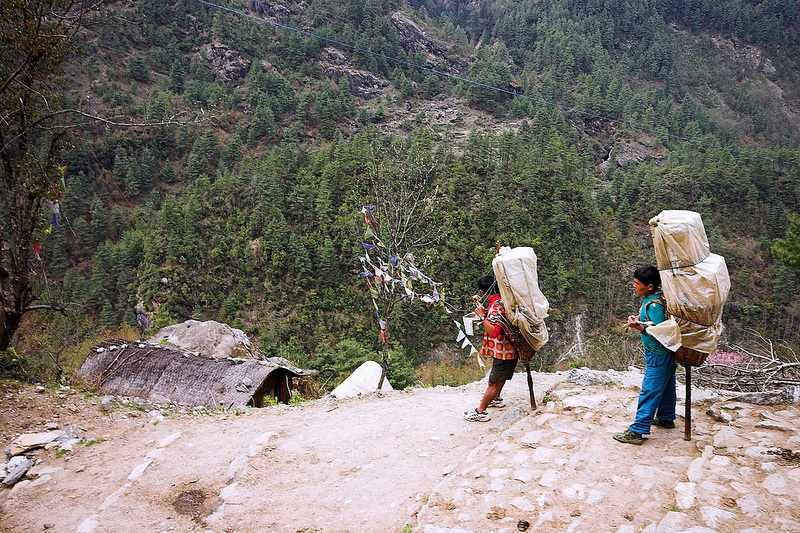 In many cultures people share common names, but Sherpas have exceptionally similar names. That's because many are named after the day of the week on which they are born. So if you're a Sherpa born on a Sunday you might be called Nima, while Monday would be Dawa, Tuesday Mingma, Wednesday Lhakpa, Thursday Phurba, Friday Pasang, and Saturday Pemba. Task 3 - The Hardest Job on Earth? You must now carefully read the second fact sheet and watch the YouTube video above. The Podcast below is also really good and the first five minutes will set the scene nicely for you. You could listen to the other 20 minutes later at home. Create a job advert for a Sherpa Guide on Everest. The average wage in Nepal is $1300 per year. The average wage for a two month Everest expedition is between $5000-6000. You will need to include physical and personal attributes. The mortality (death) rate of a typical Sherpa working on Everest is around 1.2%. That means one out of every 100 Sherpa will die doing their job. Extra Research: Watch the BBC 1 hour documentary on the Sherpa to the left. Objective: To learn about the first ever people to climb to the summit of Mount Everest and the record their adventure as a Facebook profile. 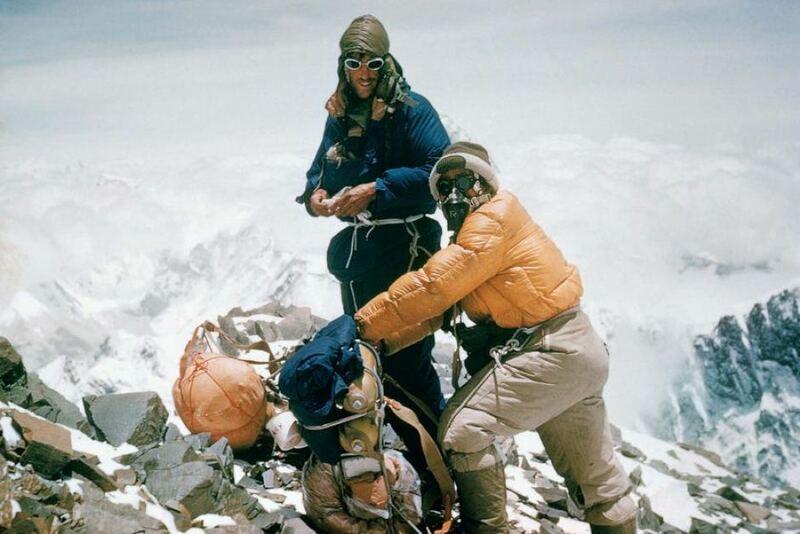 1953 was a big year for Mount Everest. After 50 million years on its own and left alone, at 11.30am on 28th May, two now famous explorers reached the summit of the highest land on earth. Task 1 - Watch the 1950's newsreel YouTube video that records the excitement after the event. Remember, there were no Tweets or Skype calls from the top back in 1953. Task 2 - Download, save and read the fact sheet above carefully. Again, use the PDF highlighter tools to mark out key dates and events. Use this together with the Planning my Fakebook worksheet to identify key people, dates and places on this historic expedition. Task 3 - Create a Fakebook profile for either Sir Edmund Hillary or Tenzing Norgay (his Sherpa) about the adventure in 1953. Click the tab above to access the programme. what happens after the adventure back home. You will need to research both people for their place of birth, date of birth etc using your Google skills. Save your work and be prepared to present your work to the rest of the class. The best examples will be hosted on this website, with your permission. Objective: To find out about the effects of the 'Death Zone' on the human body and the story behind Green Boots. The Death Zone relates to any area of a mountain that is above 8000 metres in altitude. Seemingly fit and healthy climbers and mountaineers can suddenly drop dead or start suffering from a number of illnesses above 8000 metres. There is no of knowing how your body will react until you are there. On the worksheet to the right, mark on with a red line the start of the death zone. 1. Why is the altitude above 8000 metres so dangerous to the human body? 2. What happens to the human body when exposed to prolonged conditions in the Death Zone? 3. What do climbers have to carry with them on Everest to combat the effects of the Death Zone? Open the tab above and read carefully about the effects of altitude sickness on the body. Then play the first YouTube video at above right - 'Doctors in the Death Zone' between 49:00 and 53:00. Using the Primary & Severe symptoms from the Wikipedia list, annotate all of the effects onto your unfortunate climber on this worksheet! 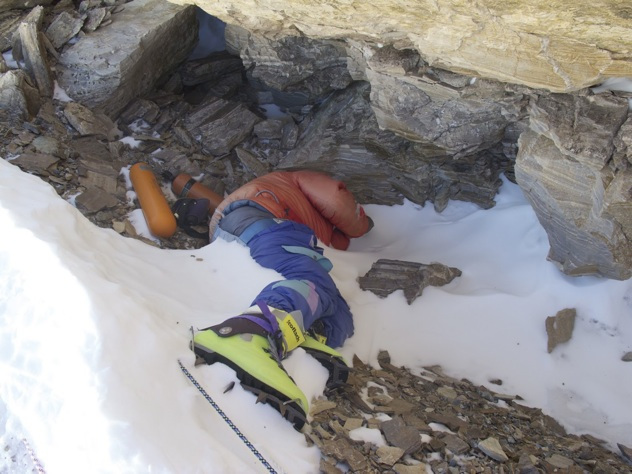 Green Boots is among many corpses remaining on Everest. Over the years it became a common term, as all the expeditions from the north side encounter the body of the Indian climber curled up in the limestone alcove cave. The cave is located at 27,890 feet (8 500 m), and is littered with spent oxygen bottles. Using the image above right and the information in the Wikipedia article, create a mini fact file on the likely identity of Green Boots and the reason why he was in the same place until 2014 when he mysteriously disappeared and then reappeared and is back in 2018. Greenboots - Died on Everest in 1996 near the summit. Picture taken in 2010. Task 5 - Open the worksheet in the blue tab above. Complete all the tasks as set out. Check, proof read and print out to hand to your teacher. Watch the trailer above 'Death Zone, Cleaning Mount Everest' and read the BBC News article here. 1. From the point of view of a relative of a dead climber - He should stay up there, it's too dangerous to bring him down. 2. From the point of view of the Sherpa - The bodies are polluting Everest and need to be removed. If you choose to, you can go into battle with someone with a different view point. You will have 3 minutes to present your arguments and must have at least 1 PowerPoint slide. You should try to include as much as you have learnt about the mountain up until this point. You will be judged on your ability to provide a thoughtful and passionate presentation that includes as much Everest Geography as possible. Objective: To find out about extreme tourism and how it affects Mount Everest. Perhaps many people think that Mount Everest is a cold and snowy wilderness. You are going to be finding out that for some parts of the year, it is not always the case. Most attempts to summit Mount Everest occur between the 1st and 23rd May as this period of the year offers a 'weather window' before the Monsoon rains (heavy snow on Everest) move in. 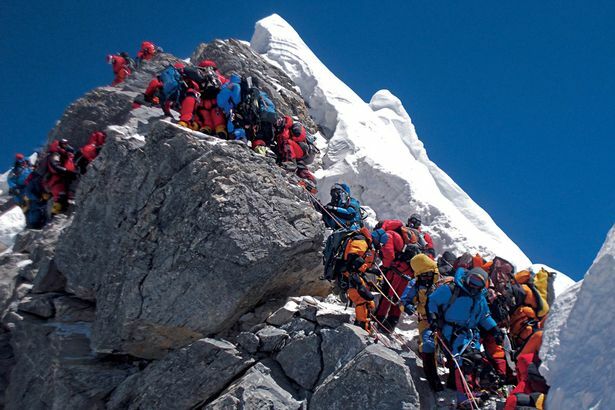 This three week period can be an incredibly busy time on Everest. Task 1 - Make a list of the problems that are caused by so many mountaineers visiting in such a short time. The tab above will take you to one of the highest resolution photos ever taken. Filmmaker and climber David Breashears used a camera with a 300mm lens to capture the 400 or so images that make up the panoramic photo. Mount Everest can be seen to the left of the middle of the stitched image. Spend a little time playing with the image, zooming and and out and learning to control the image. First one to spot a climber on Everest? Click on the green boxes to get a better view of what climbers face in each of the areas. 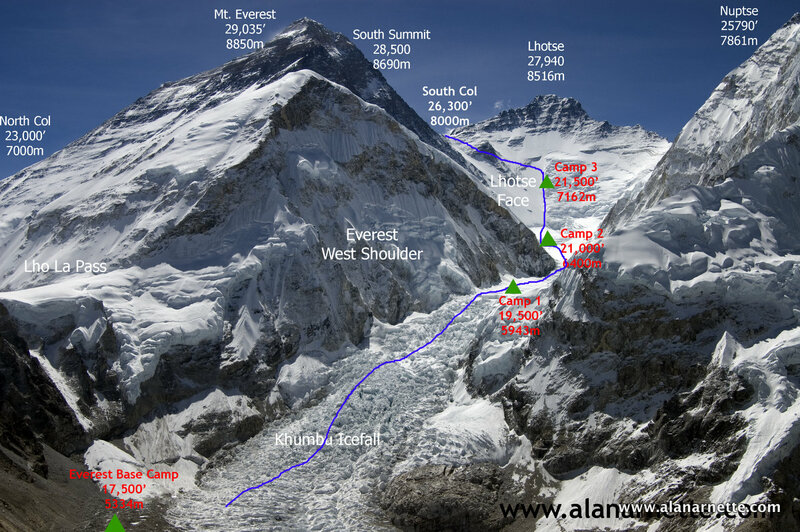 Task 2 - Match the image on the right (southern route up Everest - blue line) with the image. Can you see anyone on the route on the Khumba Icefall or Lhotse Face? You can click the image to make it larger. You can click the photo image to make it larger too. Match this with the Gigapixel Image. Can you spot anyone on the blue route? 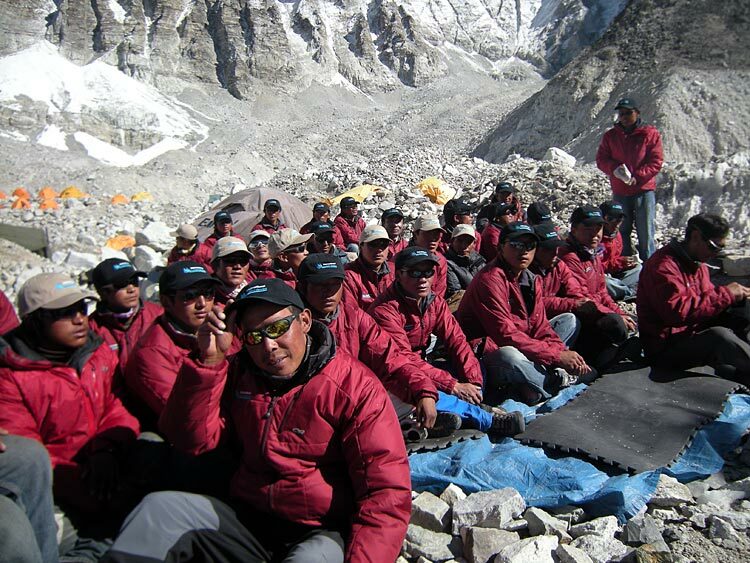 A team at the Base Camp of Everest. Did they all survive? Task 3 - You will be split into groups of 5. Each of you will be allocated a role from the worksheet above (blue tab). *The photographer is an optional role* Your role is very specific on your card. 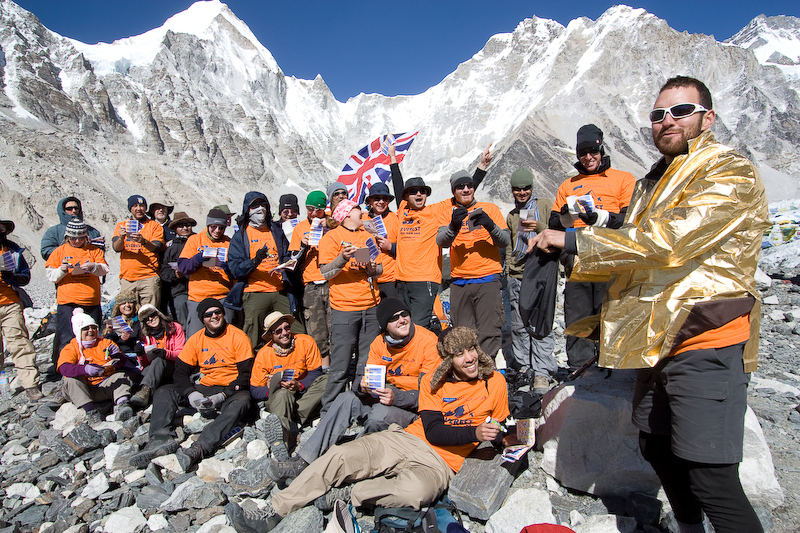 You are to work together to produce an A2 sized presentation for 'Orchbury Everest Expeditions Ltd' detailing how you plan to scale the highest mountain in the world. You must all take part and must all speak in the presentation. You will have 10 minutes per group. Your mission has been accepted (I hope!) from Orchbury Everest Expeditions Ltd and you have just spent 20 days trekking up to the base camp of Mount Everest (see map to the right). After two days of acclimatization, you are ready to go! Using the base map on the right as your guide, each member of your team (5 members) should create a diary entry detailing the journey to the summit. It is up to you how dramatic your voyage is and whether you all make it or not. Why is the Everest Death Zone so important for Nepal's Economy? 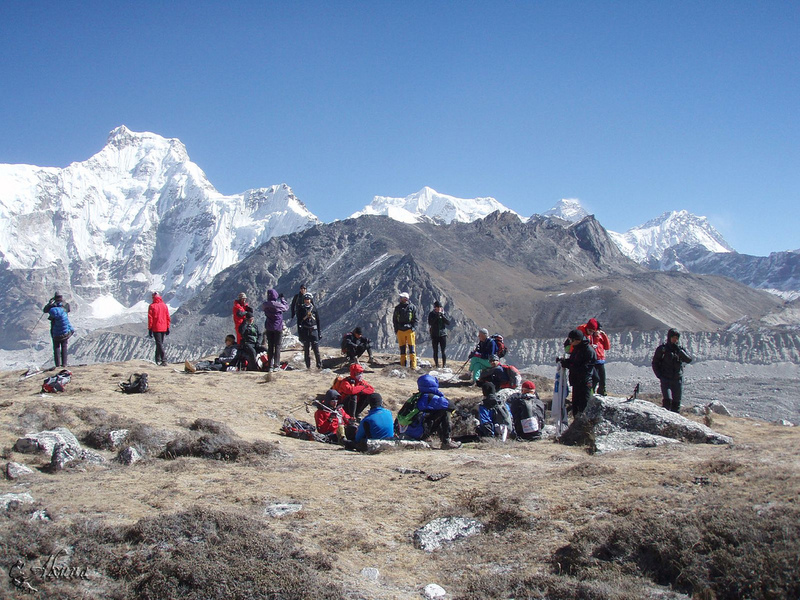 Objective: To produce a written report outlining the importance of continued extreme outdoor tourism to Nepal. Task 1 - Open and download the worksheet below and complete using the CIA World Factbook website. Links to the website are embedded on the worksheet. Why? How much do they get paid? Can you link this to Nepal’s economy? What are the global impacts? Task 3 - Check out this video - making notes as you go on the worksheet from the previous task. Task 4 - Complete these notes on the same worksheet . Watch the YouTube video to the right. i. If the Sherpa are so important, why did this happen? ii. What could the impact of this be on Nepal? Click on the blue tab to the right and find out how much it costs to climb Everest with an adventure company. Make a note of the cost and convert to € or £. Task 5 - Complete the Venn diagram fully following the instructions above it. Click the blue tab to the right to access the sheet. Open and download the 'Everest Report Student Mark Sheet' from the blue tab above. This tells you exactly what you have to do to get the best marks on each section. Your report should be about two sides of A4 types up with images, maps and text. Don't forget for the location in the introduction, you can use the work you completed for lesson 1 (at the top of this page) to help you. Thanks to The Royal Geographical Society (RGS) and Jonathan Parrott for resources in this unit of work.